Considering the Samsung T3 is already a fast drive using one of the newer USB standards on the market, Samsung didn’t really have to do all that much to refresh the lineup. As a result, the biggest change for the Samsung T5 is that it’s now compatible with USB 3.1 Gen 2, which offers a maximum throughput of up to 10Gbps, or 1,250 MB/s. However, according the spec sheet, the Samsung T5 will only use about half of that maximum bandwidth as its maximum transfer speed is rated at just 540 MB/s. Internally, the Samsung T5 is also now using Samsung’s new 64-Layer 3D V-NAND. 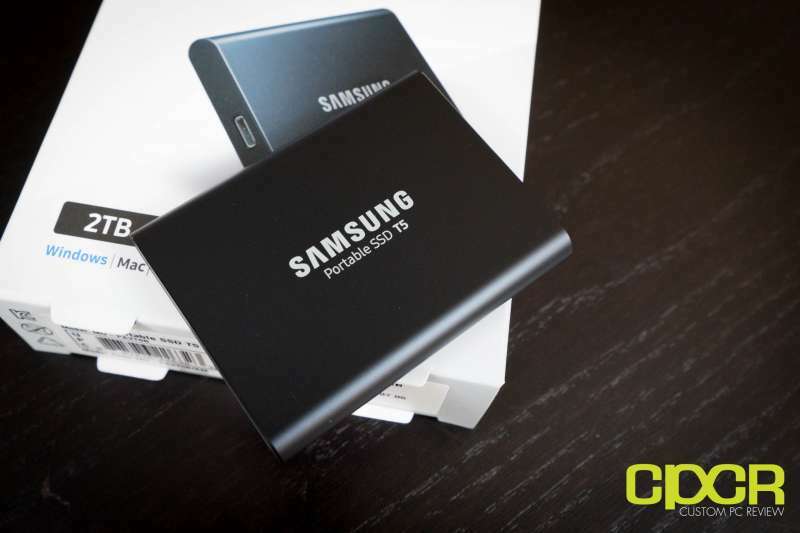 Samsung has been slowly transitioning their entire lineup of offerings to the new NAND technology and the introduction of the T5 is a perfect opportunity to integrate the new NAND. Unfortunately, the new NAND provides no improvements in terms of capacity as the Samsung T5 is offered in the same capacities as its predecessor. 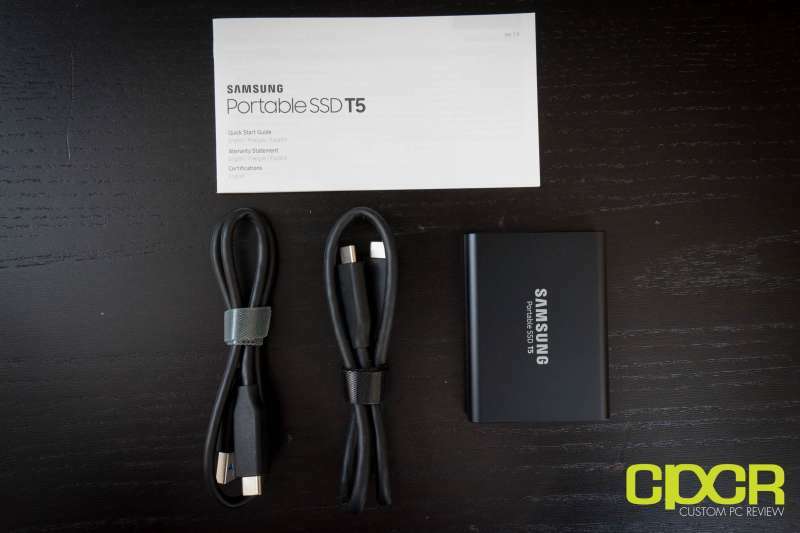 Here’s a look at the packaging for the Samsung Portable SSD T5 2TB. Included in the packaging is a quick start guide, the Samsung T5, a USB Type-C to USB Type-C cable, and a USB Type-C to USB Type-A cable. 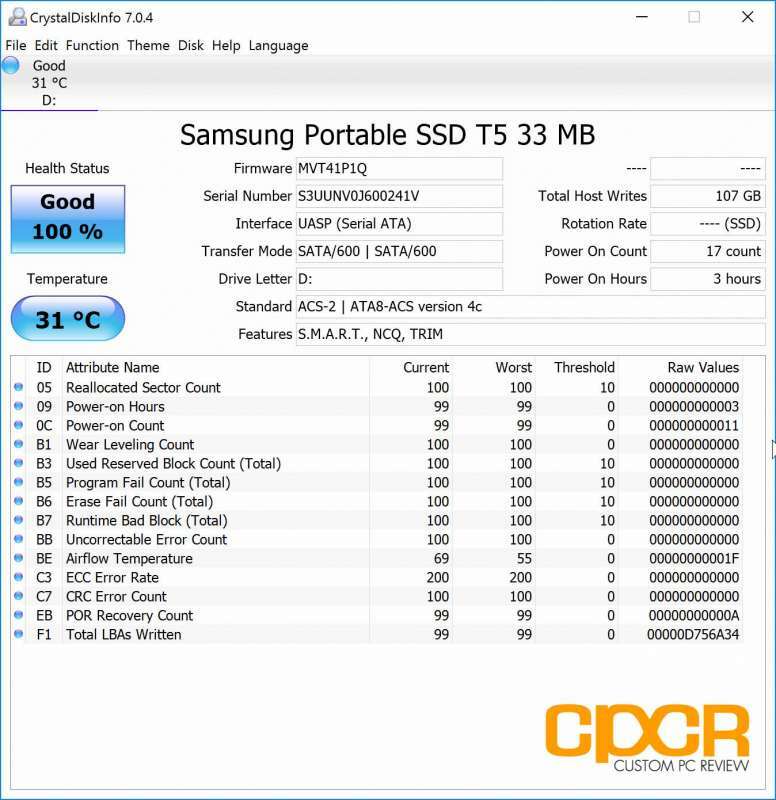 The Samsung Portable SSD T5 remains largely unchanged from the previous generation Portable SSD T3. The biggest change here is that the entire shell of the T5 is constructed completely of aluminum whereas the T3 also included a small section of rubber for enhanced grip. Personally I was a fan of the grip, but the full brushed aluminum casing is very nice as well. As for size, the Samsung T5 measures just 3.0-inches long, 2.3-inches wide and 0.4-inches deep. This makes it slightly bigger than the T3, but just very slightly. Weight of the T5 is still 1.8 ounces which is unchanged from the T3. The only I/O port on the Portable SSD T5 is the USB Type-C connector wired for USB 3.1 Gen 2. The USB 3.1 Gen 2 interface provides up to 10 Gbps maximum throughput, but don’t be fooled as the drive’s performance maxes out at just 540 MB/s. Next to the USB Type-C port is also a small LED activity indicator. Here’s a comparison between the Samsung T1 (left), Samsung T3 (middle), and Samsung T5 (right). Not a huge difference between the T3 and T5, but both drives with their metal builds are major improvements over the Samsung T1’s plastic. Today we’ll be testing the Samsung T5 2TB with firmware version MVT41P1Q. ATTO Disk Benchmark is one of the industry’s oldest and most popular benchmarks for testing disk read/write speeds. This benchmark allows read and write testing using predefined block sizes and gives us a good idea of read/write speeds with different sized files. Most SSD manufacturers prefer using this benchmark when advertising SSDs as it tests using compressible data, which tends to yield best performance. In ATTO Disk Benchmark, the Samsung T5 is able to reach 555 MB/s sequential reads and 523 MB/s sequential writes. This is essentially the maximum performance possible with an internal SATA SSD and is a substantial improvement in performance over the last generation T3. 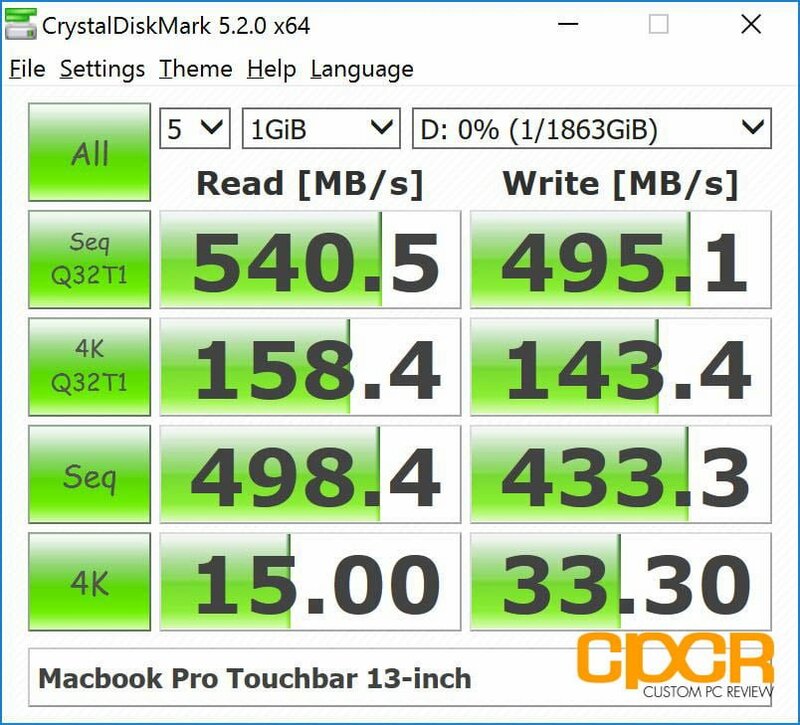 Crystal Disk Mark is another popular benchmark which allows us to measure sequential read/write speeds, 512K random read/write speeds, 4K random read/write speeds, and 4K QD32 random read/write speeds. With this benchmark, tests can be run using both random fill (incompressible data) and 0 fill (compressible data). Realistically in typical computer usage scenarios, data being transferred will consist of a mixture of both incompressible and compressible data. Crystal Disk Mark performance mirrors that of ATTO Disk Benchmark. Sequential performance is fantastic although 4K performance is a bit lacking, mostly due to the USB protocol stack. 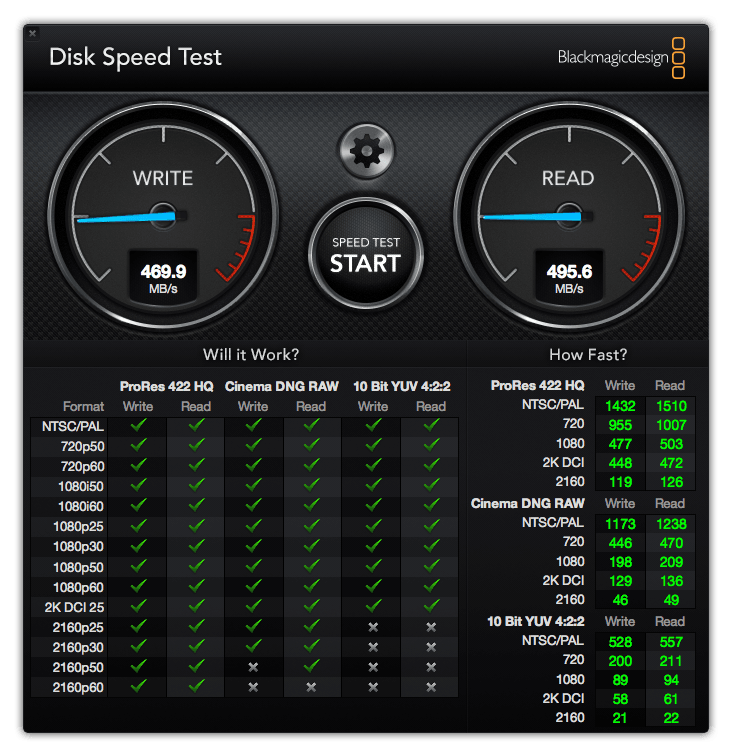 Blackmagic Design Disk Speed Test is a MacOS benchmarking utility for testing disk speeds for use with Blackmagic Design video production software. The benchmarking utility provides an easy to read interface that tells users which video formats can be supported based on the drive’s performance and provides quick and easy information on the disk’s read and write performance. The Samsung T5 was able to achieve 495.6 MB/s sequential reads and 469.9 MB/s sequential writes in our testing. According to the Blackmagic Design Disk Speed Test utility, this is enough for video editing at 1080p and 4K at 60p using the ProRes 422 HQ codec. It’s unfortunately not quite enough for Cinema DNG RAW or 10-bit YUV 4:2:2 in 4K at 60p. Since it’s difficult to translate what 450 MB/s, 250 MB/s, 120 MB/s, etc. means in minutes and seconds in real world applications, we’ve also prepared several real world testing scenarios transferring files to and from the drive, and recording the amount of time necessary to complete the operations. 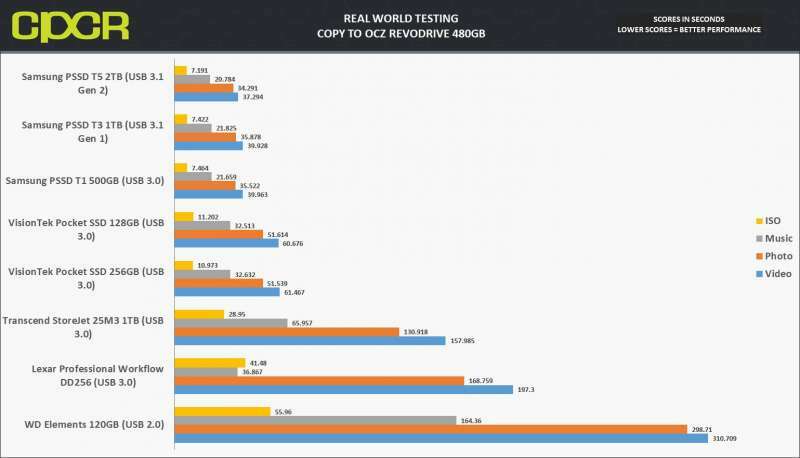 In our copy from test, we’ll be copying our filesets one at a time from our test drives to an OCZ RevoDrive 350 to reduce any chance of the host bottlenecking performance. 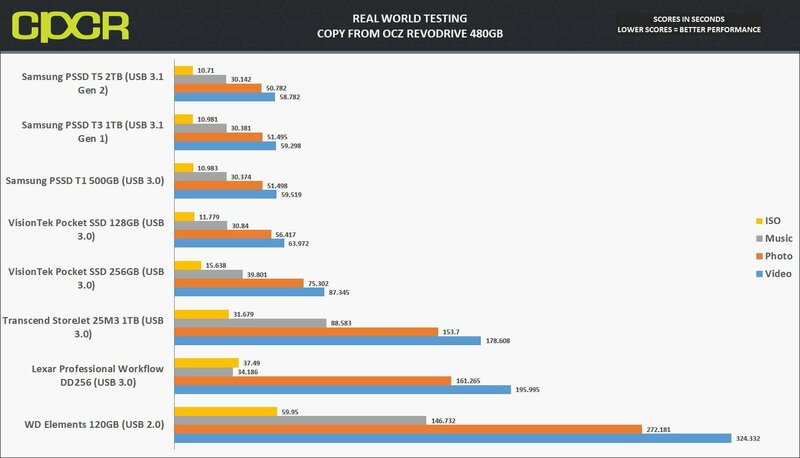 The OCZ RevoDrive 350 is a PCIe Gen 2 x8 SSD capable of up to 1,800 MB/s sequential reads and 1,700 MB/s sequential writes. 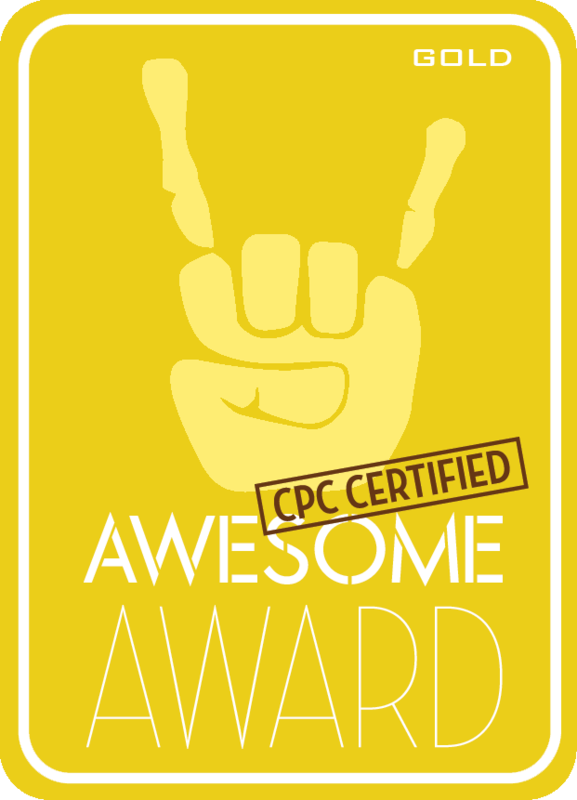 In our copy to test, we’ll be copying our filesets one at a time from the OCZ RevoDrive 350 to our test drives. The Samsung T5 is significantly faster than competing USB 3.0 external hard drives, transferring files 2-4x faster depending on the fileset. Compared to Samsung’s older T3 or T1 portable SSDs, the real world performance difference is relatively small with the biggest difference seen in the video test where the data consists of large sequential video files. 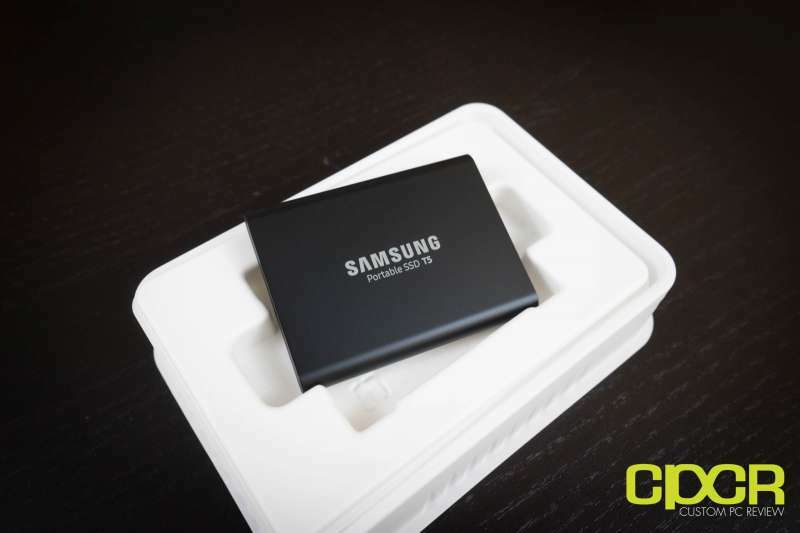 One of the biggest features of the Samsung Portable SSD lineup is the encryption software which allows users to take encrypt the drive by taking advantage of the SSD controller’s built in hardware encryption engine. When enabled, the Samsung T5 encrypts all data on the drive using AES (Advanced Encryption Standard) 256-bit encryption, which is an encryption algorithm used by various corporations and government agencies to encrypt data. Most notably, it’s approved by the National Security Agency (NSA) for encrypting top secret information. Encryption support is available for systems with Windows 7 or higher, OS X 10.7 or higher, or Android KitKat (4.4) or higher. The software will be pre-loaded onto the Samsung T5, but will also be available on the Samsung website. 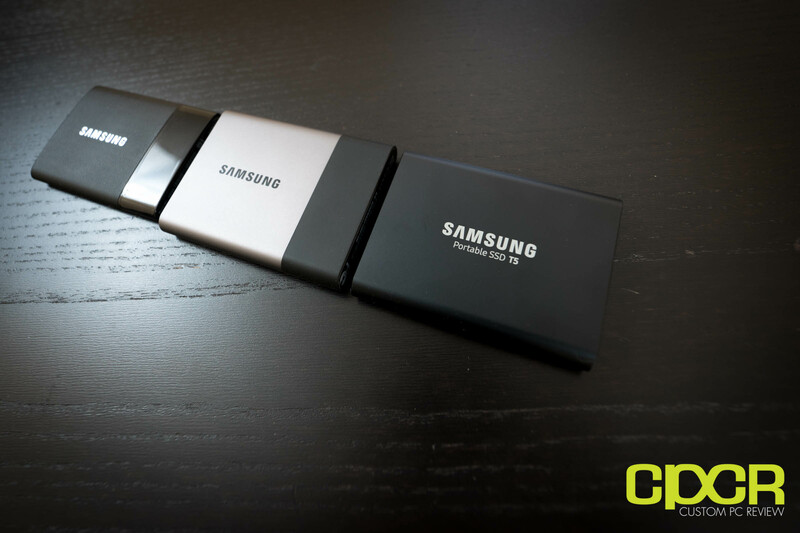 For Android support, Samsung is also releasing an update to the Samsung Portable SSD app, which will be available in the Google Play store. For the Samsung T5, Samsung updated the Portable SSD software giving it a more modern UI although the core functionality remains largely the same. On the initial start, the software will ask for a password which will be used for device encryption. Once encrypted, the password will need to be inputted to unlock the drive’s contents. Be warned. All the drive’s contents will be lost if the password is forgotten. Samsung has also updated the Android app for the Portable SSD as well, giving it the more modern UI makeover as well. Here, unlocking the drive is the same exact process as unlocking the drive on the PC. 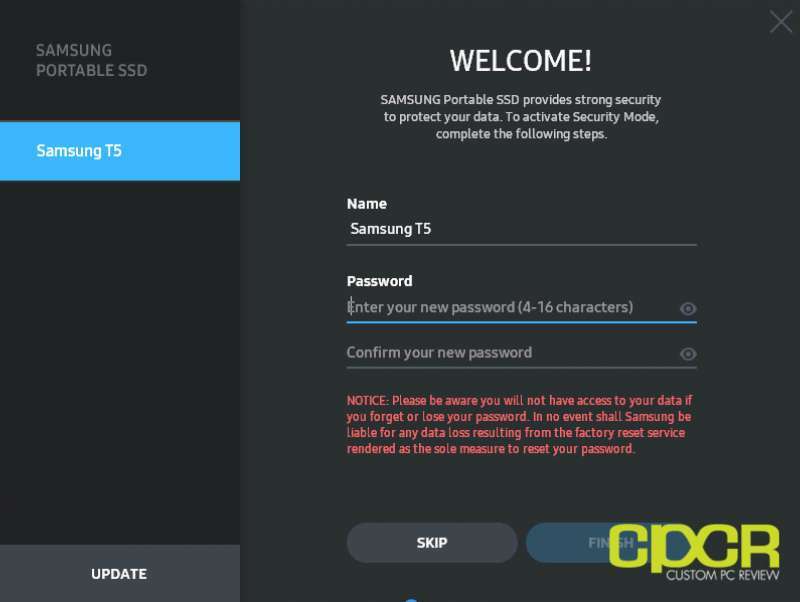 Simply connect the Samsung T5 to the Android device, fire up the Samsung Portable SSD software and input the password to unlock the drive. Once unlocked, the drive can be accessible directly through the file manager. Similar to past generations of Samsung’s Portable SSDs, the Samsung T5’s performance is the same with or without encryption. As such, encryption is highly recommended especially if you keep sensitive information on the drive. The Samsung T5 is a slightly upgraded version of the Samsung T3 which we were very impressed by last year. As such, it’s the new best external SSD you can buy today. 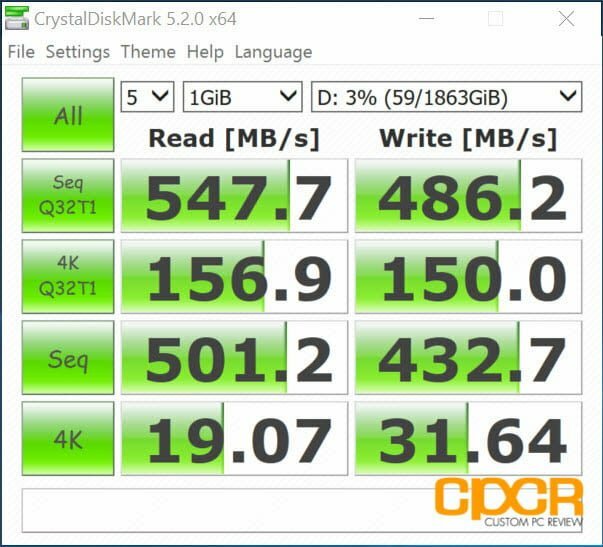 Performance on the Samsung T5 is slightly faster than the T3 and at 555 MB/s, it’s pretty much the maximum sequential read/write speeds of the mSATA drive used within the drive. 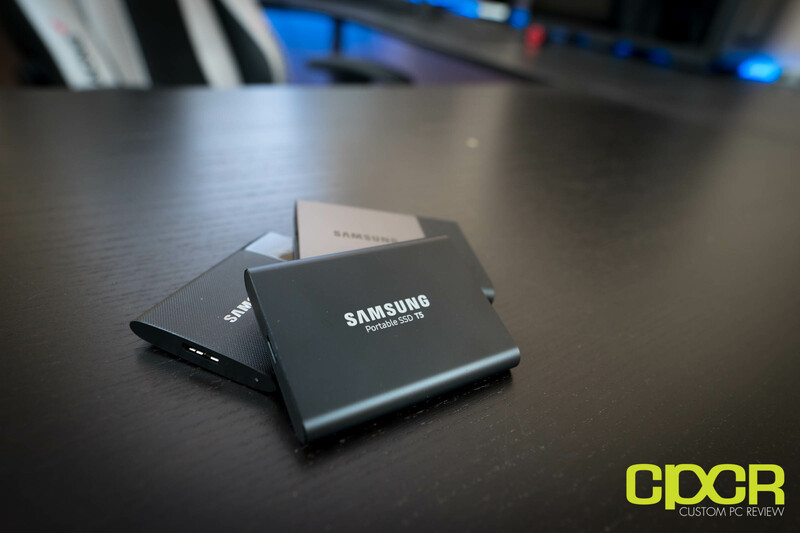 That said, while performance is good, what’s disappointing about the Samsung T5 is that we were hoping that Samsung would finally deliver an external SSD solution based on some of their even faster PCIe SSDs. Given that the Samsung T5 is aimed at content creators, a Thunderbolt 3 based drive with something like a Samsung 960 PRO internally would be highly desirable for those working with large media projects on external storage. Pricing on the Samsung T5 Portable SSD remains unchanged and will start at $129.99 for the 250GB up to $799.99 for the 2TB edition as reviewed today. This puts the price/GB ratio at around $0.40/GB for all capacities 500GB or higher. Like the Samsung T3, prices are likely to be lower once the drive hits the market for a few months, but the unchanged pricing is likely an unfortunate result of the NAND shortage that’s expected to last until 2018. The Samsung T5 isn’t a major update over its predecessor, but it still remains one of the top external drives on the market. 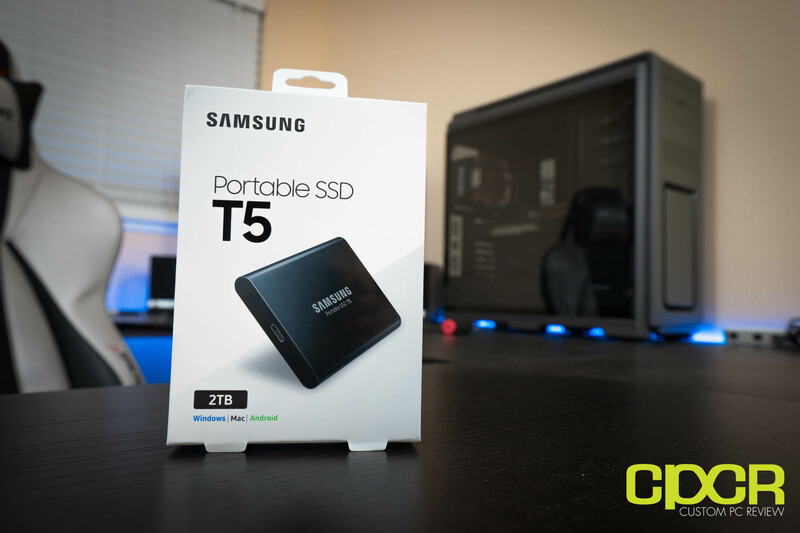 Ultimately, those who want a fast, portable, beautiful external SSDs with offerings up to 2TB capacities will find the Samsung T5 an excellent choice. Highly recommended!